Those with keen eyes and sharp memories will note that this is not the first time (nor will it be the last) that I have referenced 30 Rock’s wonderful song “Werewolf Bar Mitzvah.” It is one of my favorite anythings of all time, mainly because it is A) a Halloween novelty song (yes, a parody of one, but it still works), and B) in being both a parody of, and a Halloween novelty song in itself, there are lots of shout-outs to various types of monsters. Basically, I love things that have lots of monsters in them (Note: I will not watch Hotel Transylvania as that looks like horseshit). For those who are confused, Google all of that. 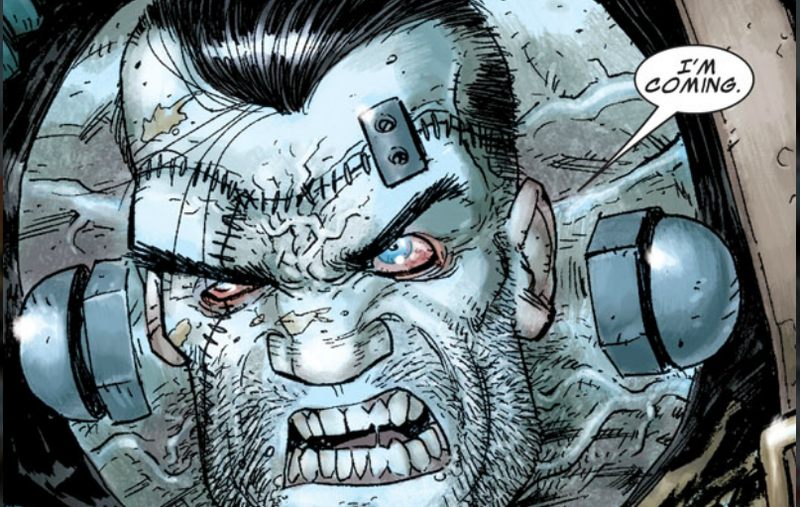 I’ll be explaining one thing and one thing only since this is my comic blog, and that is Franken-Castle, which features Marvel vigilante The Punisher revived as a Frankenstein-like creature. See, The Punisher was killed by Wolverine’s son Daken, who was working for–ah, it doesn’t matter. If you really need to know this stuff, there are recap pages in these comics. But they’re really not necessary to enjoying this. It’s a fun blend of action and horror, and the premise is this: Frank Castle, a man who waged a one man war on crime, died. Monsters brought him back to life as one of them in order to protect them from a fanatical group of merciless monster hunters. 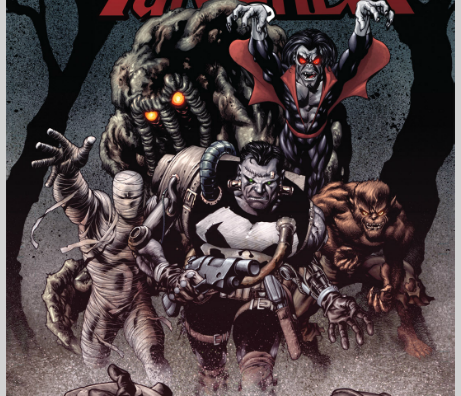 Monsters both in the “Vampires, Werewolves, Frankensteins” breed and the “History shows again how nature points up the folly of man” variety of giant city-destroying creatures appear en-masse in this arc of The Punisher, written by Rick Remender and drawn by Tony Moore with some fill-ins by Daniel Brereton, Roland Boschi, Jefte Palo, Paco Diaz and John Lucas. 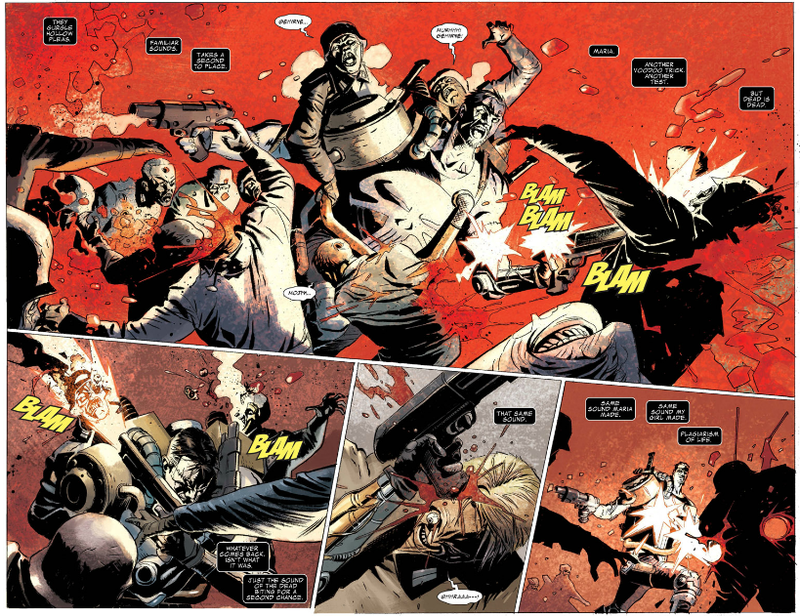 Moore brings a kinetic and cartoony approach to this, showing that he was totally wasted on the talking heads style of comic book storytelling in The Walking Dead. 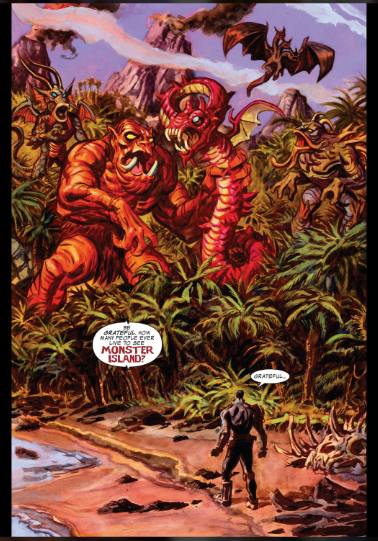 He also brings his unique take on classic monsters designed by Jack Kirby in the 60s and by artists like Gil Kane and Mike Ploog in the 70s. 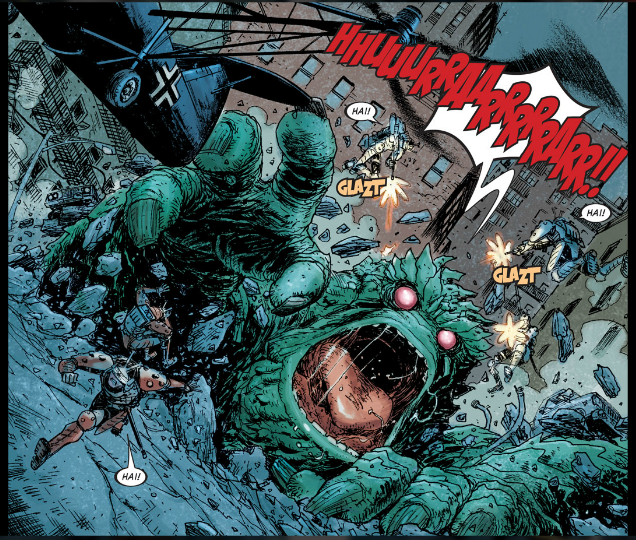 Brereton draws the most issues after Moore, and brings a nice 70’s monster vibe similar to Gene Colan to the book. His work shines in both the villainous monster hunter’s flashback story and in the final issue of the series that ejects Castle from the world of fantastical monsters and re-inserts him in the world of the real ones: murderers, drug dealers, and other criminals that’s very existence depress me so I won’t bother to list them. But anyway, forget that this book starts and ends in the “real” world of the Marvel Comics Universe. Instead, focus on the meat of this story sandwich: (a) Frankenstein with guns teams up with a vampire, a werewolf (by night), a merman, a mummy and a gaggle of other monsters of various shapes and sizes. And they fight evil monster hunting scientists dressed as samurai! Samurai! 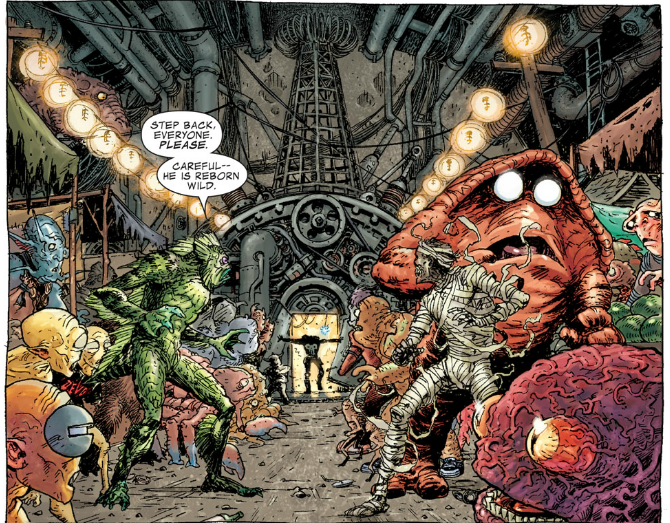 I mean come on, look at the sheer amount of monsters that Tony Moore fit into one panel. ONE PANEL. If you’re not excited at this point, you’ve got a face punching coming your way. See? Franken-Castle…is coming…for your face, to punch it! And on top of ALL of THAT, he fights Nazi Zombies! Yeah, Nazis, we’ll keep bringing you back in popular culture just to kill you all over again! F You! 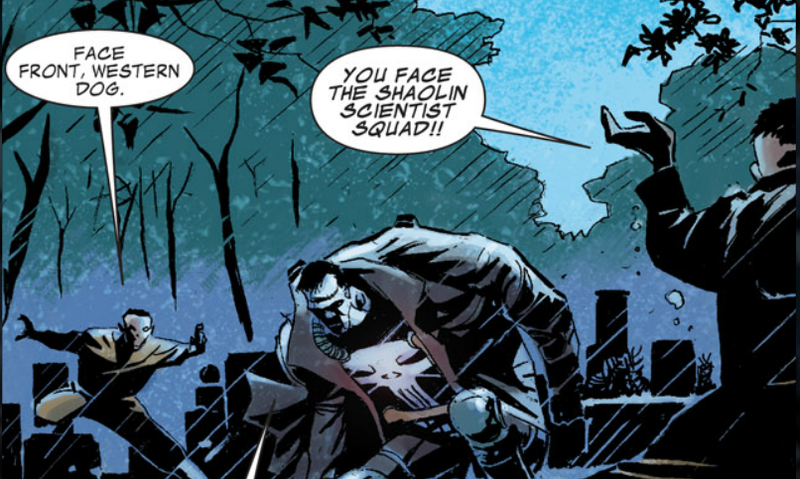 All of that and I didn’t even mention the Shaolin Scientist Squad, an another insane and silly creation of Rick Remender. Are you hitting the “BUY” button over and over again on your computer devices??? Basically, what I’m saying, is that this is another great example of a major comic book publisher giving free reign to a creative team to try something a little different, with awesome results. See also: Defenders. Hawkeye. Comics are not just defined by super heroes, and heroes are not defined by the super hero genre. And Monsters can be beloved as well as feared and break out of their own genre conventions to have super fantastic adventure times. A good comic doesn’t have to be “Realistic,” or “independent” for it to be good. Or to be awesome. A good comic has to entertain you and one of the ways it can do so is to do things so ridiculous, so imaginative and over the top, that they can only be done in comics. This is such a thing. I don’t want to see a film of it, live action or animated. Because this is a comic book that made sweet sweet love to my imagination and I don’t ever want to see it any other way. If you’ve ever loved a monster movie, and especially if you’ve loved the ones where they all meet, then READ THIS COMIC! You can purchase this on Comixology, and if you do so in the next few hours you can get the whole story for .99 an issue. (Issues 11-16 are the strongest, 17-20 are hit and miss, though have some fun moments before everything wraps up nicely in issue 21). You can also get a big ol honkin book of it on Amazon, or at your local comic store.